Sen. Jim Risch (R., Idaho) took over the powerful foreign policy committee this month and said in an interview the panel plans to hold a hearing next month to examine America's role in the world and the challenges it faces. Those challenges include China, Russia, Iran, North Korea, and terrorism. "Nom's are like the laundry—they're never done," he said using shorthand for nominations. "Every day you open the laundry basket there's stuff to do, and we're going to pursue it as aggressively as we can." The administration's list of nominations to be voted on expired at the end of the year. The process must now be restarted so that nominees can either be confirmed or denied by the Foreign Relations Committee and then the whole Senate. However, Risch said aside from nominations and other issues, the committee's time is often spent dealing with international events or crises that take precedence over immediate and long-range issues. "As far as the committee's concerned, you have things that you want to accomplish. But as with a lot of different jobs, you wind up where those things are out of your hands and you end up dealing with issues you have no control over, as far as them raising their ugly heads," he added. "We'll deal with those as we have to, but our priority obviously at the top is confirmations. If you don't get people in place, you don't have a government. We want to help the administration get their government in place." The conservative senator, a supporter of President Trump, said he is in frequent contact with the White House and last week held a meeting to discuss moving forward with nominations for State Department and ambassadorial posts. Trump on Sunday voiced his support for the new chairman, tweeting that Risch "Will do a fantastic job!" Of the many issues for the committee, China ranks high. "Obviously China is going to be an issue," Risch said, adding that national news media attention has been overly focused on Russia when greater attention should be placed on China. "China is a much bigger player than Russia," he said. But many news outlets prefer writing on Russia "because they can always tie in Trump [and] that's how you sell newspapers." The United States remains the preeminent world power. But China in the 21st century is "gaining quickly." Risch said he is cautiously optimistic the United States and China will reach an agreement to end the ongoing trade dispute involving tariffs. China is getting hit hard economically as a result of a downturn in its economy and the tariffs and needs an agreement to end the dispute, he said. A major issue for Risch is China's illicit practice of stealing American technology. Risch has pressed for a whole-of-government response to Beijing theft of an Idaho company's unique semiconductor technology. A Chinese state-run company stole valuable Micron Technology know how and Risch raised the issue with the president, and the Treasury and Justice Departments. In November, a federal grand jury in San Francisco indicted for the first time a state-run Chinese company involved in the theft of Micron's unique DRAM, or dynamic random-access memory, chip technology used in artificial intelligence for both the commercial and military sectors. The indictment charged that a former Micron executive was linked to the theft of Micron's trade secrets that ended up at the Fujian Jinhua Integrated Circuit, Co., Ltd, the state-owned company. "I had a robust conversation with the Chinese ambassador where he attempted to defend the undefendable," Risch said. "I think this is an appropriate case to draw a line in the sand. [The Chinese] know that they're short on the industry that Micron deals in, mainly the memory chip industry. If they're going to be successful in their China 2025 initiative, they know they've got to do things with microchips." Risch said that while he understands global business competition, "you should do it legally, under the rule of law and not just flat out steal it, as they did to Micron." Asked if the Foreign Relations Committee would consider sanctions legislation against China for its cyber and economic espionage, Risch said "I don't think that script is done being written yet." "That's a work in progress and is going to continue to mature," he said. Risch said current tariffs—more than $250 billion were imposed on Chinese goods last year—are similar to sanctions. "The president has already used that and it's having an effect," he said. On China's failure to live up to past agreements to end cyber economic espionage and also a promise from Chinese President Xi Jinping not to militarize the South China Sea, Risch said he agrees China cannot be trusted. "But that doesn't mean you shouldn't try [to get a trade agreement]," he said. Like denuclearization talks with North Korea, the United States has been "kicked" several times by Pyongyang but "we still keep trying and we're in progress there," he said. The committee is expected to address two arms control issues with Russia: The Intermediate-range Nuclear Forces Treaty, and the New START strategic arms treaty that will end in 2021. Arm control advocates want the treaty extended. Administration sources have said the treaty is unlikely to be renewed in its current form without major revisions. Risch said relations between the United States and Russia are extremely strained over incidents like Moscow's 2016 election meddling and the covert GRU operation to poison a Russian intelligence defector living in Britain. "Our relationship with Russia is so bad," Risch said. "They keep doing really, really bad things. We keep sanctioning them and we're going the opposite direction instead of the right direction. It's unfortunate, but, you know, we as a country just can't look the other way on some of these things." The chairman said China is also a factor in INF, not just Russia, noting "when it comes to dealing with Russia [on INF] … it's no longer a two way deal, it's a three way deal." The Trump administration announced it will withdraw from the 1987 INF treaty unless Moscow destroys the SSC-8 land-based cruise missiles that violate the agreement. The treaty prohibits ground-based missiles with ranges of between 310 miles and 3,400 miles. Moscow announced on Monday it would not destroy the new cruise missiles, setting the United States on a course to back out of the INF treaty. 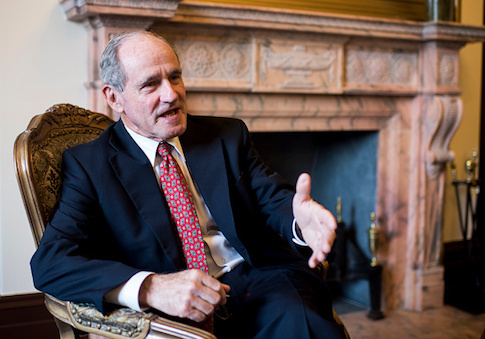 Risch said the Foreign Relations Committee will examine the treaty dispute and that there could be legislation on the matter. "But frankly, the Russians don't have any friends up here," he said of Capitol Hill. "So I don't know that it would do any good." Risch declined to comment when asked if the Russians are violating the New START treaty in addition to the INF treaty. However, the senator said the New START accord "is in the same boat" as the INF treaty and Russian officials have sought talks on extending the treaty. "But they've got a lot of talking to do before we get there," Risch said of treaty extension. "Things are just not good right now. I mean this isn't a regime that has endeared the trust of the United States, or for that matter anybody else, to them." "How can you trust these people? Treaties, particularly disarmament treaties, are really, really good if you've got two people acting in good faith. And the words Russia and good faith are an oxymoron." Risch said he supported pulling out of the Iran nuclear deal and opposed the agreement from the beginning. He also favors the decision to re-impose sanctions. The Iranian regime is "going to feel the sting of these sanctions," he said. Negotiators are "back to the drawing board," with Iran yet Risch said Iran has not changed its behavior and illicit activities at all. "We've got to keep the pressure on," he said. The senator said he gets along well with Secretary of State Mike Pompeo and is in frequent contact on foreign policy issues. Pompeo also has handled the notoriously difficult State Department and Foreign Service bureaucracy well. "Pompeo gets that," Risch said. "He knows he's in charge of a huge bureaucracy that will be there long after he's gone. But he knows what he is doing over there and I feel really good about where he's going." This entry was posted in National Security and tagged China, Jim Risch. Bookmark the permalink.